Before you see M. Night Shyamalan’s upcoming film The Visit on September 11, 2015, you might want to revisit an extraordinarily personal account of his previous film, Lady In the Water. 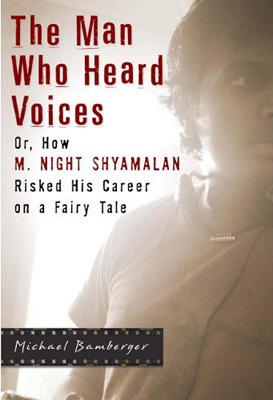 This involving book, written by sports writer Michael Bamberger, delves into filmmaking and M. Night Shyamalan’s personal experiences before, during, and after the filming of Lady in the Water, an underrated film judged on its box office take more than its merits. As the title suggests, Bamberger puts a personal perspective into this filmmaking process to entice readers into an interesting exercise full of realism and power. This book is a great alternative to countless “making of” and summarative text accounts of box office successes that produce a victory march or marketing campaigning instead of an engaging book. Of course, seeing the film, an expanded version of Shyamalan’s bedtime story to his children, and his other works helps readers grasp the filmmaking aspects better, but there are no prerequisites. “I want to see somebody else’s take on what I do. I want to learn something,” says Shyamalan. That’s how we get better, right? Or, maybe it just gives The Enquirer magazine buying public an opportunity to exercise their “build them up, tear them down” life philosophy. This book gives readers the opportunity to discover these events for themselves as they learn more about this high-profile filmmaker, and filmmaking in general. First, Bamberger establishes Shyamalan‘s unique, rare status (the convenience of making films near his home in Philadelphia and how his name carries so much weight on the theater marquee, just as much as an “A-list” star). The emotional, sometimes visceral experience of a Shyamalan film (e.g. that big plot twist) definitely raises the expectation bar. All that responsibility could weigh any person down, but Shyamalan exhibits great confidence and healthy perspectives on life. This step-by-step insight into how a director puts a movie together holds some interest largely due to an eclectic, eccentric cast and crew (Chris Doyle for starters). Bamberger delves into Shyamalan’s personal life a bit (his wife Bhavna and some of the eighty home movies he made beforePraying with Anger), but focuses mostly on the professional work throughout the Lady shoot. The book also touches on filmmaking concepts like coverage, beats, and the casting process, fleshing out the process even more. Choosing actors “with good mental health” like Paul Giamatti, Sarita Choudhury, Mary Beth Hurt, and Cindy Cheung combined with a talented crew in a family-like atmosphere creates a successful film, right? Everyone’s having a great time filming it, and many elements seem to be clicking well, so what’s left? Bamberger incorporates his “voice work” theme here well, especially how Shyamalan reacts to criticism from just about everyone. I wonder how Shyamalan’s perspective on the film critic character, played by Bob Balaban, could’ve enhanced this book more. Readers will experience internal thoughts when studio executives are involved and when crew members irritate each other — real life issues that prove, even in Hollywood, things aren’t always as they seem and people see only what they want to see. Readers can easily insert examples of individual go-getters in business management, sports and more who have everything resting on their shoulders. Shyamalan’s life philosophies, also exemplified by his previous Philly neighbor Allen Iverson, permeate through the detailed activity accounts. Shyamalan realizes the time he must invest to succeed and even declares he could compete against any NBA player with unlimited time to practice after two years. It’s not egotistical, he believes in himself and his abilities, which we all struggle to do. Bamberger himself even gets into the act in a parallel golfing story he wrote that matches Shyamalan’s suffering under criticism so well it couldn’t be omitted from these proceedings. Shyamalan continues to tinker with the film until the July 21, 2006 opening date (he adds introductory information about the “blue world” through narration), but by then it’s too late to save the film from box office doom — an $18 million plus opening only materializes into an approximate total of 42 million domestically). The most impacted number here though is the film‘s budget and marketing campaign ponied up by Warner Brothers. Still, the box office numbers game (what about the international box office receipts?) takes a back seat where Shyamalan “loses” this film venture. The screenings at Shyamalan’s farm ended up testing better than The Sixth Sense, so why no large public response? Was Bryce Dallas Howard’s role too light on background to make the audience care about her in the end? Many people in the book who “just don’t get it,” include Nina Jacobson, an important executive at Disney who brought Shyamalan to the Mouse House, which Shyamalan then left. She’s a constant force in Shyamalan’s criticism that he considers often throughout the book, and as he finds solace and some confidence his new studio partner, Warner Brothers. The Man Who Heard Voices is a detailed look into a detailed filmmaker. How about a follow-up on why Shyamalan left Warner Brothers for 20th Century Fox to make The Happening? Was it all about the studio’s money or the amount of faith in a filmmaker‘s visionary abilities to reach audiences in their hearts and, consequently, their pocketbooks? This entry was posted in Book Reviews and tagged Book, Books. Bookmark the permalink.